We have clearly reached a tipping point in our culture for gender equality, as evidenced by the wave of women rising up to political leadership positions, women launching businesses, women fighting for equal pay, and women speaking up in record number about sexual assault and harassment. Whether it’s the Women’s Marches or the #MeToo movement, there is a growing sense that we cannot go back to the old ways of looking at gender inequality, and the current changing climate demands us to get to the root of the issues and form new and more equal foundations. This means focusing on what we teach kids from a young age about gender, especially when it comes to boys. How can parents, educators and caregivers ensure they are instilling in young boys that girls are equal to them, and should not be treated any different when it comes to inherent value in the world? While it is largely up to parents to be the ones leading the way on this in the home, in the pop culture and media space there is ripe opportunity to present important messages in entertaining and engaging ways. 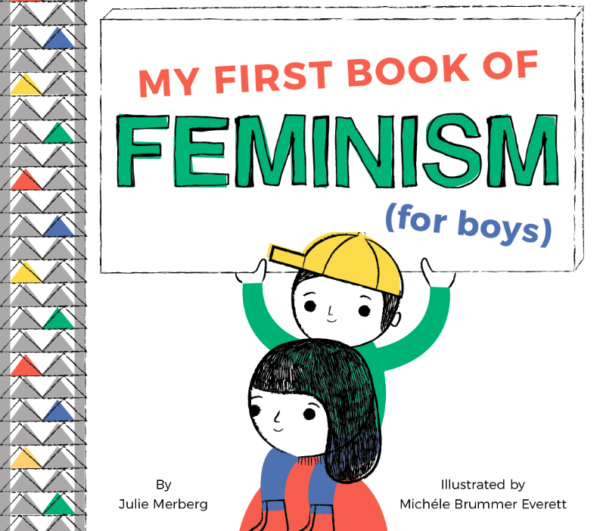 So when we came across Julie Merberg’s ‘My First Book of Feminism (For Boys)’ book, from Downtown Bookworks we realized this is exactly the kind of tool that can become a powerful weapon against inequality, sowing the seeds of what it means to treat women as equals from a young age and giving easy-to-understand examples. 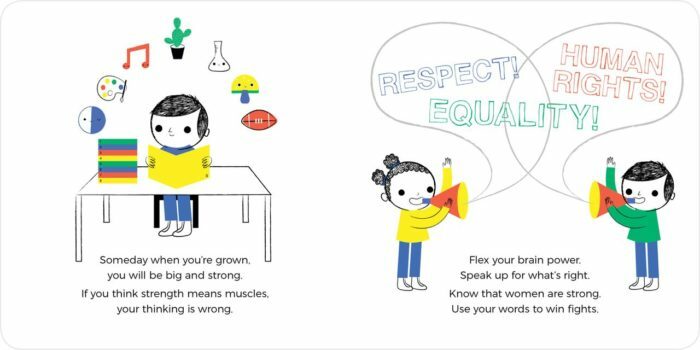 Simple illustrations from Michéle Brummer Everett paired with engaging, rhyming text make the compelling, age appropriate argument that girls and boys are equal, plain and simple. 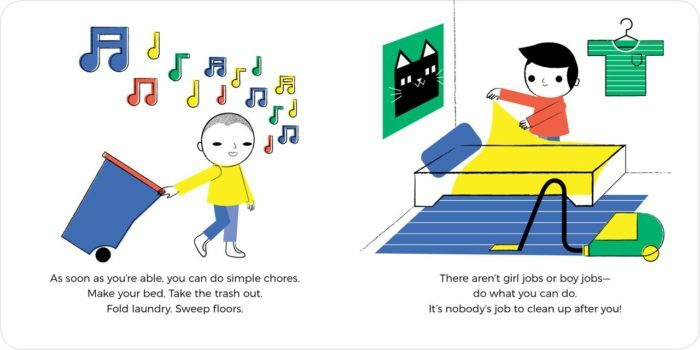 Humorous, familiar scenarios are treated as teachable moments for very young boys (ages 0–3) who will ideally grow up without ever questioning women’s equality. From “no means no,” to “women’s rights are human rights,” important, grownup ideas are made clear and fun for young, impressionable minds. This is the book every mom should read to her son. In ‘My First Book of Feminism (for Boys)’, as it should in society, equality goes both ways. Boys are encouraged to express a full range of emotions, play with whatever toys they want, pitch in with housework, befriend girls and people who are different, and explore what it means to be strong. “When we talk about strength in this book, we emphasize that it’s not about muscle,” says the author. 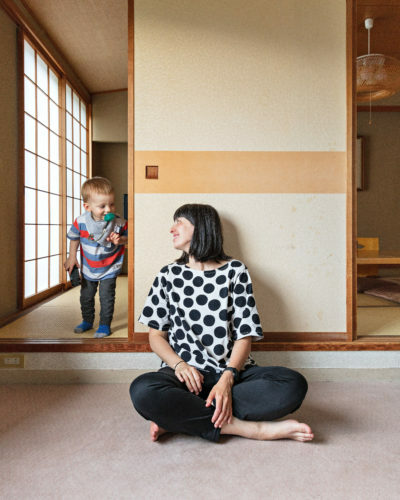 “When you are around small children, I think it’s very easy to see them as they are now and not focus on the person they’re going to become,” says illustrator Michéle Brummer Everett, who is currently raising a toddler son. When discussing why this book is so timely, Julie doesn’t hesitate or hold back in talking about how the current political and social climate became fuel for her book. who casually demeans women on a regular basis. In other parts of the world, girls are still denied an education, and women are forced to sleep outside the home when they’re menstruating. This book will be important until it’s no longer necessary,” she said in a press release. “As long as we live in a world where men, especially men in powerful positions, do not face consequences for their treatment of women, then a book like this is relevant and necessary,” added Michéle, alluding perhaps to the fiasco around the Brett Kavanaugh Supreme Court confirmation hearings and the way the Senate Republicans treated sexual assault allegations against him. 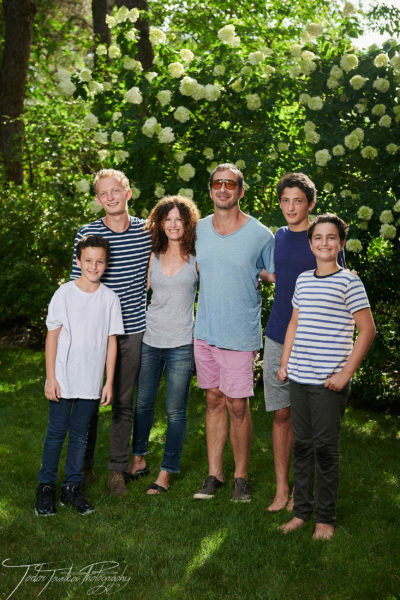 As the mother of 4 sons, Julie’s own home life and her role as a parent definitely played a huge part in shaping her personal view of feminism, and why it is important to engage men starting when they are young. “I am constantly conscious that the things I say and do, as the only female in my home, will shape my sons’ views about women for the rest of their lives. I taught all of the boys how to fish and ride bicycles and how to start and run a business. I think it’s a safe assumption that my sons don’t have preconceptions about what men or women are supposed to do. I’ve also talked to them A LOT about the importance of respecting women—not only their bodies, but their feelings,” she said. Michéle says she feels a great sense of responsibility in her role as a mom of a young son because she knows the younger years are fleeting, and he will spend most of his life as an adult male. “I think about this quite a bit. How do I want him to treat women? How do I teach him to really care about women and value their voice? How can I teach him to stand up for those who are being treated cruelly? What kind of man am I hoping to raise?” she said. The author herself is thinking what we’re all thinking: we would’ve LOVED to have this book around when we were younger! But nevertheless it exists now and we have a chance to use this to influence a whole generation right now. Even in the most progressive-minded families and houses when it comes to gender roles can find room to improve, as Julie found. “Discussing the book with them this past year while I was working on it led to some really interesting, intense dinner table conversations about gender and cultural norms that exposed the gap even between my husband (a very progressive self-identified feminist who was raised by a single working mom) and my children’s views,” she shared. “However, the cultural shifts over the last few years have totally changed that view. My boys now understand that they can’t be passive bystanders in this movement. The biggest change I’ve seen over these last years is an encouraging one: younger kids are embracing social responsibility. I guess that’s one of the reasons it felt completely natural to write this book,” she added. Her advice other moms of young sons to help them grow up with a solid sense of accomplished women alongside men is to read them books featuring strong female protagonists, as well as biographies of amazing women. “They don’t need to be beat over the head with the idea. We just need to normalize the presence of powerful women in their lives,” she said, and we couldn’t agree more! 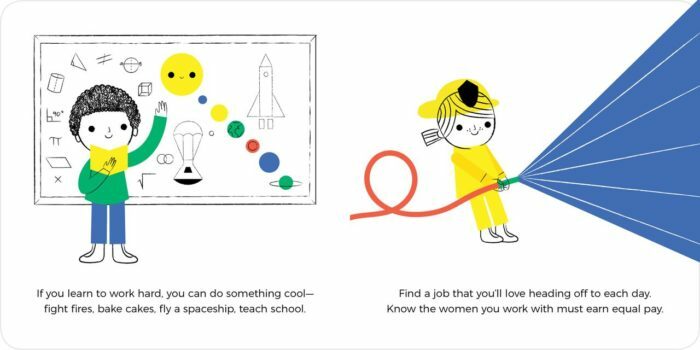 At the very core, ‘My First Book of Feminism (for Boys)’ takes away the common fears and misconceptions about feminism, and brings it back to basics. “I think the word “feminism” itself is more of a problem than the actual notion of equality is. Babies love their moms—that is a natural instinct. And probably the easiest first message—and our first page in the book—is about respecting your mother. It seemed like the right way to ease into the notion of feminism. Then we go one baby step further: Respect your mom, not just because she’s your mom and not just because she’s a woman, but because she’s a person,” said Julie. 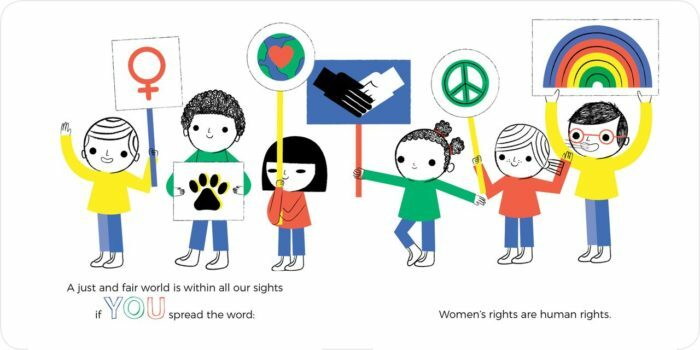 We love what the book stands for, the messages and values both Julie and Michéle want to share, and know that with more educational, fun learning tools like ‘My First Book of Feminism (for Boys)’, the future of equality will not feel like such a far-off distant pipe dream. Order your copy now from Amazon, Indiebound or Barnes and Noble from the Downtown Bookworks website.